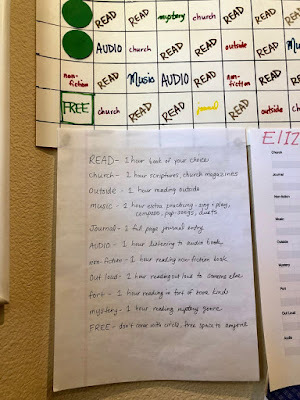 Every summer we try to encourage the kids to read with something fun. We've done game boards, a beach scene, caterpillars, scratch-off boards, balloon pop, and a plinko board. This year we are playing a 5-in-a-row game. 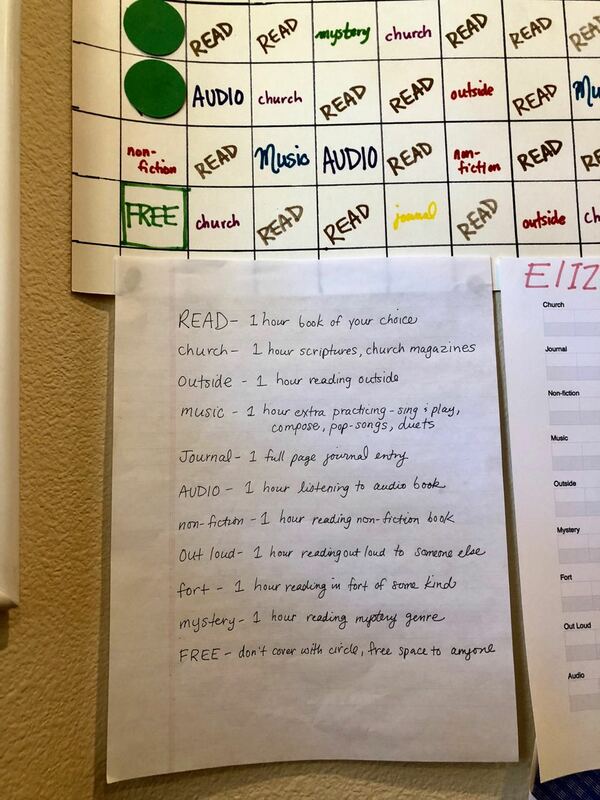 You choose what you want to encourage your kids to do. 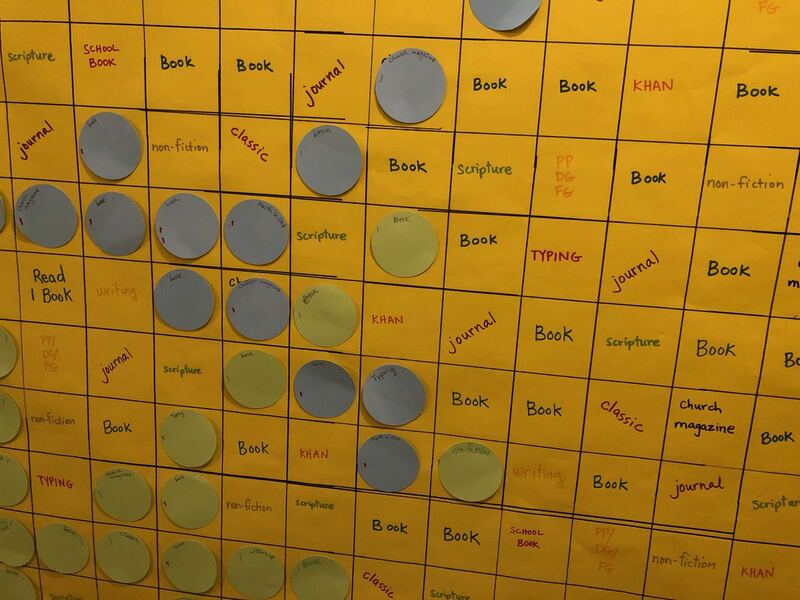 My sister chose for each of her squares to be earned after 1 hour, and chose some different genres to put on the grid. After earning a circle, they pick it out of their envelope and take off the coupon. 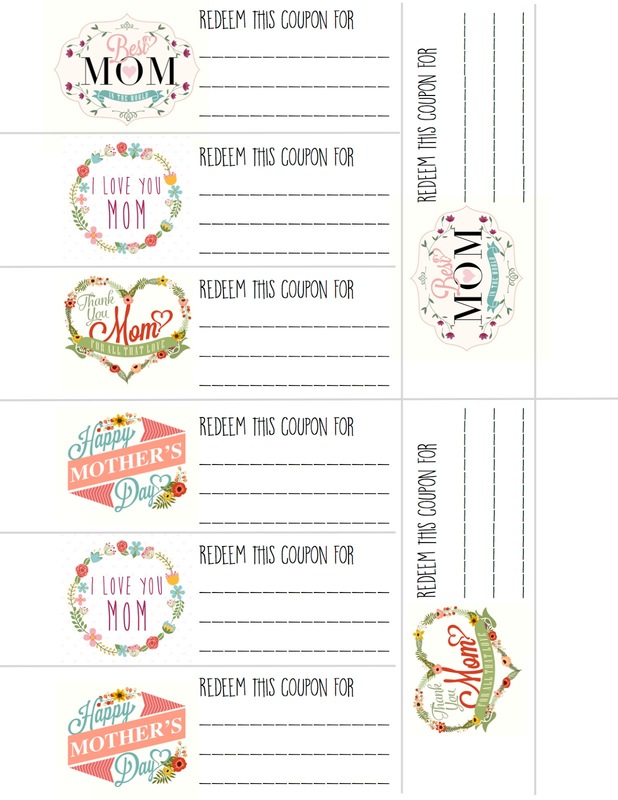 You can find my coupons here: summer reading coupons. They then choose where to put the circle on the grid. When they get 5 circles in a row they get to choose a prize from the prize basket. Some of the coupons include a free circle and taking off a circle, so if someone is blocking you there is a way to remove it. However, if a circle does get removed I tell them they just put it back on a different square of the same type so that the other child doesn't lose that circle. I also say they must have a circle to put on that space if they are removing one - they can't just remove one to make their sibling upset. 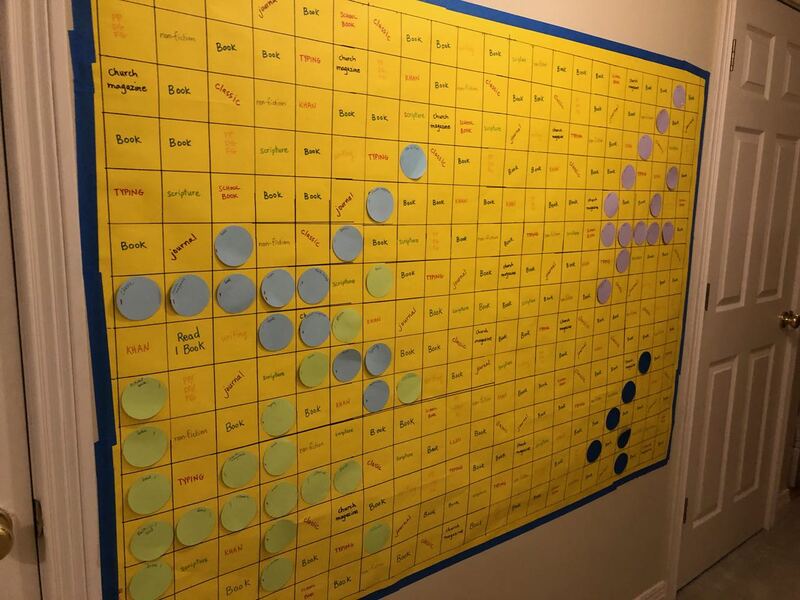 I've told the kids that they can only reuse 1 circle in their row of 5 - so that to earn a prize they at least need to have 4 new circles, but that may change depending on how quickly they fill up the board and run out of room. I put a mark on their circles once they've been used in a row of 5 so I don't get confused which ones are new. 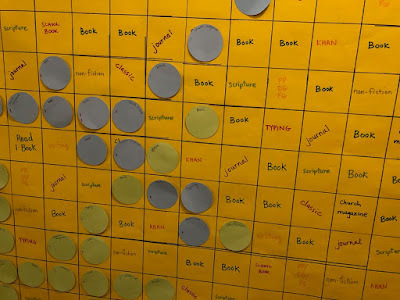 I also write on what they did to get the circle so the kids don't have to look underneath to see what it was if they're looking to remove a circle. Since this is the first summer we've done something like this I have no idea how well it will work. So far the kids are loving it and reading lots. I guess we'll see if I need a new board half way through the summer! 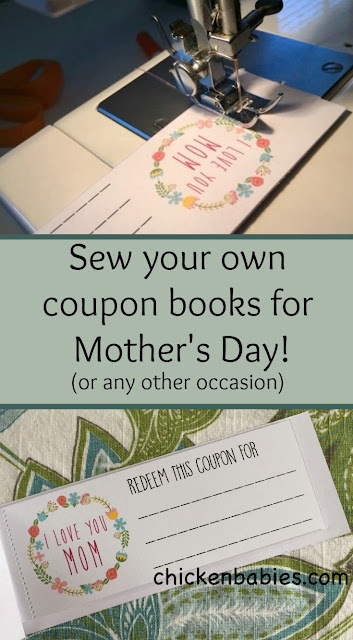 Coupon books are an easy present for kids to make and give their mothers. 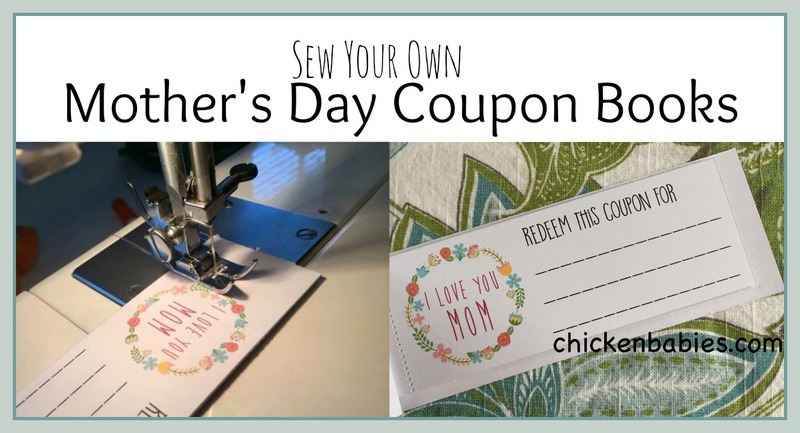 I work with the girls at our church, and with mother's day coming up, I wanted to make a small gift with their girls that their moms would enjoy. We made these small coupon books and they were a hit! 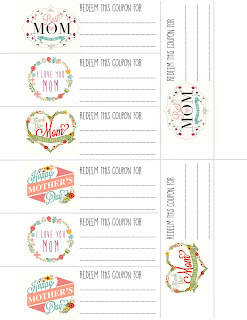 To make your own, print out the coupons (or make your own) and cut apart the coupons along the lines. 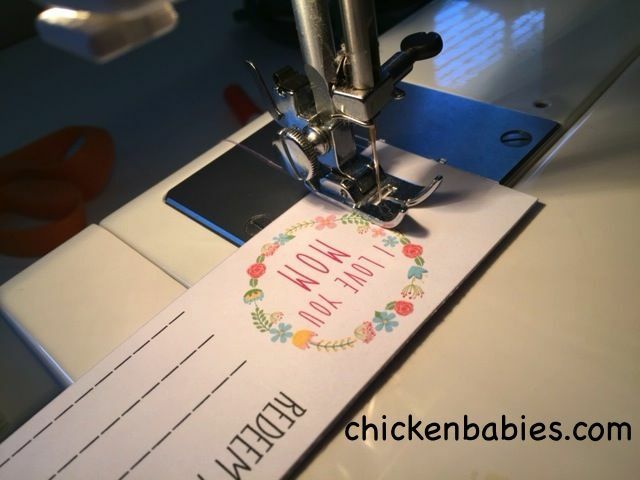 If you want to attach the coupon books with brads or ribbon, you can print on card stock. 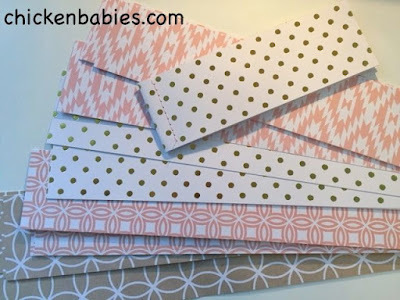 If you want to sew your books together, just use a nicer paper; not as thin as regular printer paper, and not as thick as card stock. I found some old nice resume paper that we've had for 15 years and never used. Now take the thread off your sewing machine and run your coupons through on a setting that puts the stitches close together. Do it about 3/4 inch in from the side. This will create the perforation so the coupons can easily be pulled from the books. I put 8 coupons together for my books. I cut a piece of card stock that was 2 inches by 12 inches, folded it in half, and stuck the coupons inside. With the nicer thin paper, I was able to sew along the edge to make the book. 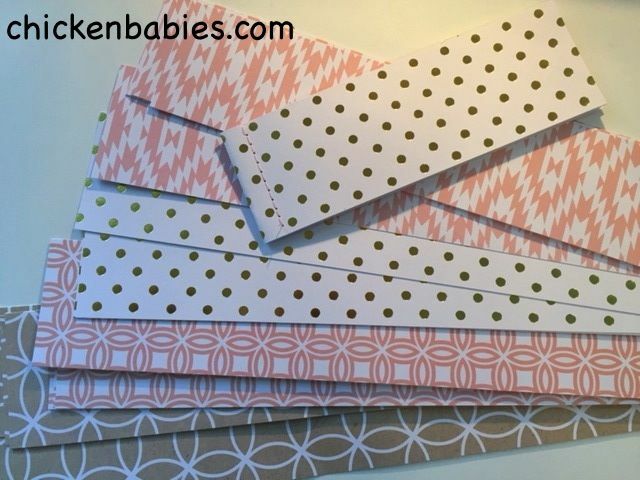 With card stock, punch holes and string through ribbon or brads to make the books. - a day when the mom is always referred to as "your majesty"
- for a whole day, all questions/problems/arguments go to dad first! 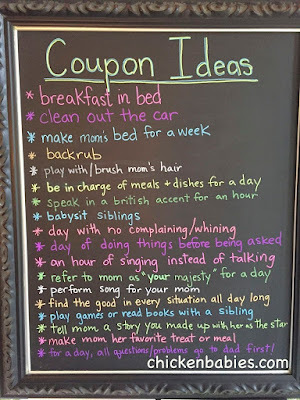 I told my daughter I wanted her to give me the british accent or singing one, and she said she wouldn't because I would probably try to redeem it when she was out with her friends. She knows me too well. 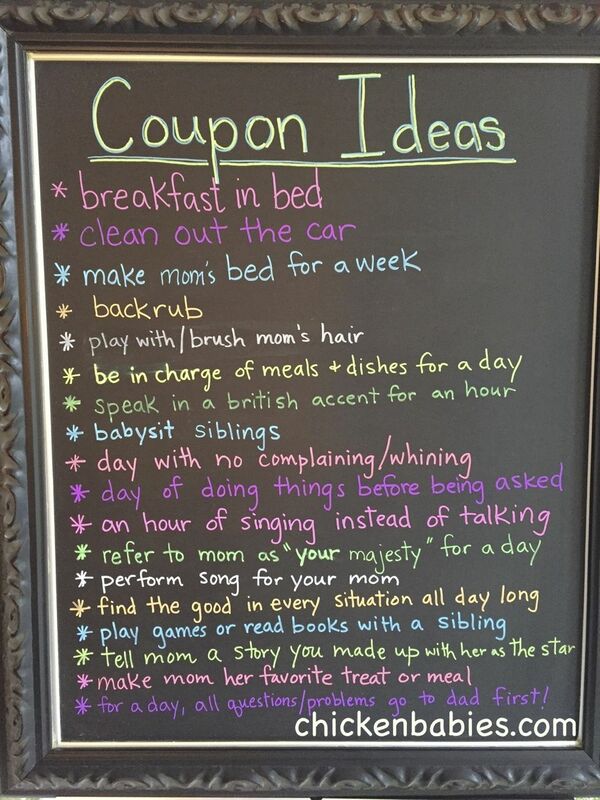 What coupon ideas would you add to the list? This jungle adventure birthday party theme works for boys and girls, requires little money but lots of imagination. 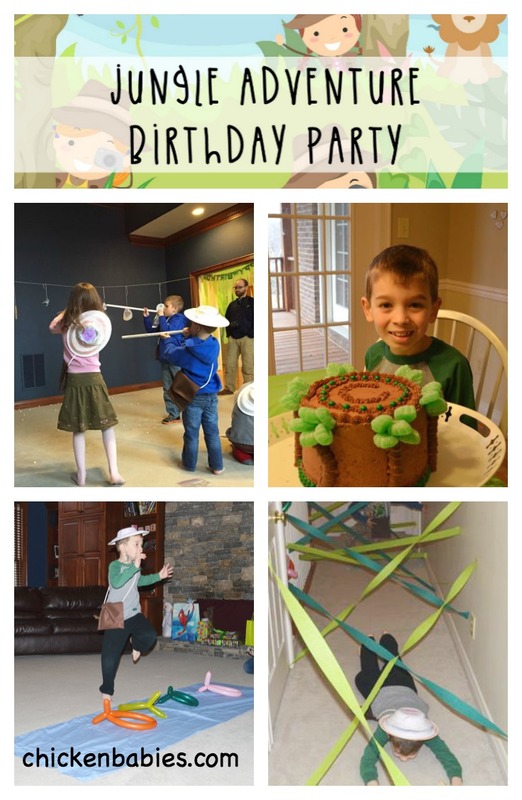 When Christopher turned 8 years old, we threw him a jungle birthday party. He was very involved in choosing the theme and the games he wanted to play with his friends. The party took about an hour and a half including time for presents and cake. I like to have an open-ended art activity going for the guests when they arrive that they can work on while we wait for everyone to get there. 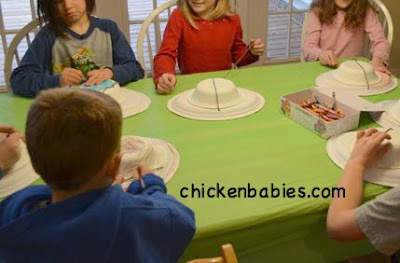 For this party I had the kids decorate their paper-plate jungle hats. I bought oval paper plates (they were Chinet platters) and paper bowls. I cut a hole in the platter (just so it would fit on the kids' heads better) and glued a bowl upside down on top. The kids colored with crayons and we used string to tie them on to the kids. You can also have the kids make fun jungle binoculars with cardboard tubes if you happen to have enough saved up. I didn't. 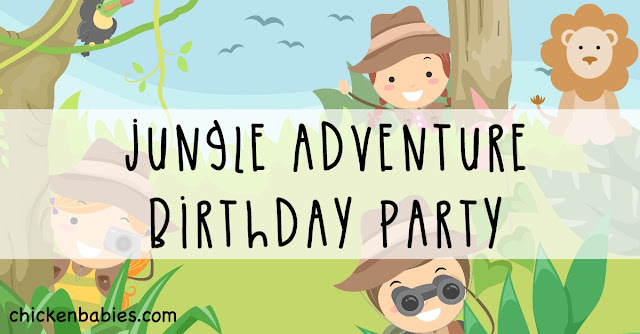 Once everyone had arrived I handed out their jungle bags which they would use to collect items they found along their adventure. These were super easy to make and involved no sewing. 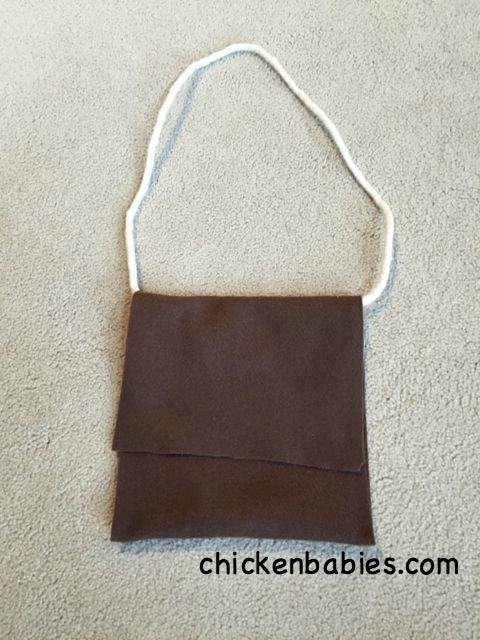 I bought brown felt and some cording. First cut the brown felt into a rectangle about 8 inches wide and 21 inches long. Cut a piece of cording about 34 inches long. 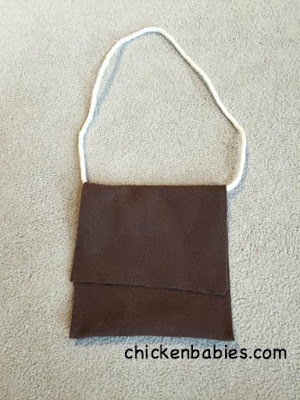 Fold the brown felt about 7 inches up to make a pouch (the top part will hang over the pouch) and hot glue the sides together. While the glue is still hot, stick the cording in between the felt folds so it is attached with the glue. 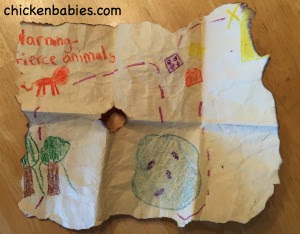 When Christopher got his bag, he happened to find a treasure map in his!! (I had told him it was in there and he was supposed to pretend to be surprised when he found it). Everyone decided we should follow it to see what we would find. The first picture on the map showed us traveling through jungle vines. 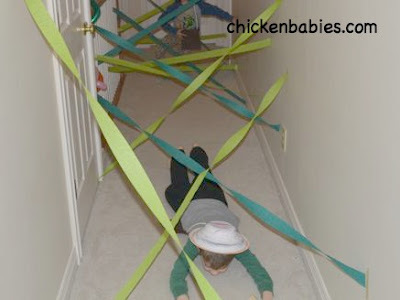 The kids took turns going through the vines and avoiding the balloon snakes my daughter had made (which you can't really see in the pictures). After successfully traversing the vines they received a bag of red vines to put in their brown felt jungle bags. Next, the kids had to conquer some wild beasts. Christopher had colored some animal faces on paper plates. We strung them up with yarn across our family room. We armed each child with a pvc pipe dart gun and gave them a bag of marshmallows for ammunition (we let the marshmallows sit out for several hours to harden up a bit to make them easier to shoot and less squishy if they got stepped on). They lined up and shot at the targets. There was lots of cheering when they managed to hit a paper plate! Then the grandpas decided they should be wild animals and turned into moving targets. The kids loved that! After they defeated the wild animals, they got a bag of circus animal cookies to put in their jungle bags. The next item on the map showed the kids crossing piranha river. Unfortunately for the kids the river was flooding! I took a blue bed sheet and folded it over a couple of times. 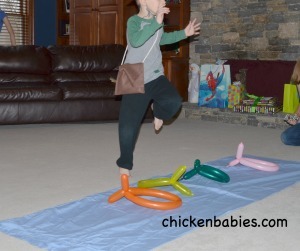 My daughter made some balloon fish to stick in the "water". The kids lined up and all took a turn jumping across. After everyone jumped at the current width we made the river grow wider by unfolding the sheet. If a child touched the water, they were eliminated and sat down. Each time the water grew a bit more. The game was to see who could jump over it when it was really wide, but you could also play without eliminating the kids when they touched the sheet. After this game they got a bag of Swedish fish for their jungle bags. On the map next was a bunch of Lego bricks. Strange, huh? But as I said, Christopher was heavily involved in planning and really wanted to build with his friends. So, we decided that the kids would come up with their own creations to help them get through the locked door that was blocking our way to the treasure. We got out a bucket of Lego bricks and the kids got to work. 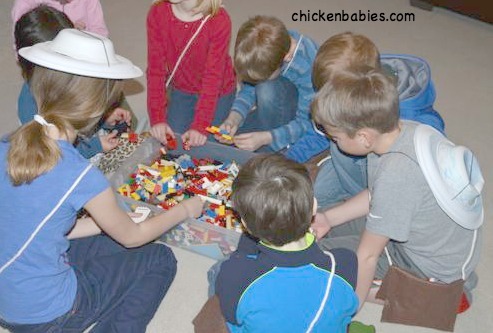 We gave them about 10 minutes and then they each got to get up and show people their creation and tell them what it did and how it would help us get to the treasure. 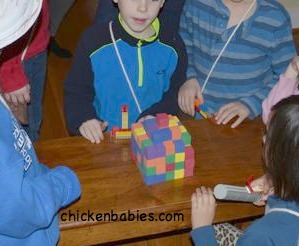 The kids were very enthusiastic about this activity and loved showing off their inventions. 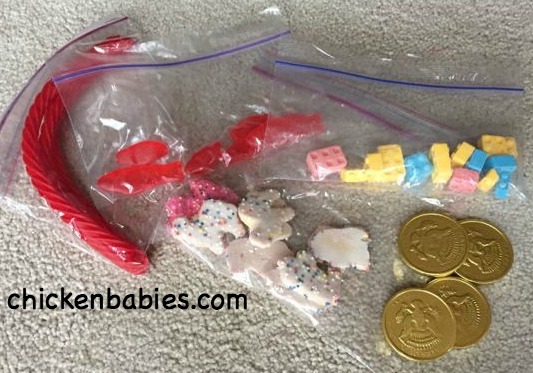 They received a bag of candy bricks to add to their collection of things found in the jungle. Lastly, we took our inventions to get into the treasure room. 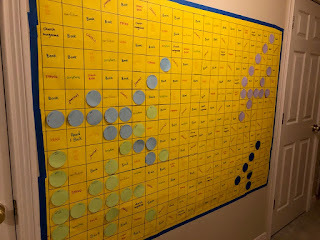 This last game was chosen by Christopher because he thought it was so fun when we did it at Joshua's Minecraft party the year before. We stacked up foam blocks. Some of the blocks had a little picture of gold taped to it. The kids took turns picking off blocks until they found one with the gold picture. Then they got their bag of chocolate gold coins to put in their jungle bags. The kids got more candy than I usually give out at parties, but I'm sure you could also come up with some non-candy things to represent each adventure if you'd rather not give out so many treats. I tried to make the treat bags small anyway. We then went into the kitchen for cake and ice cream and presents. I made Christopher's cake 4 layers tall so I could make jungle trees on the side. The trees are made with Rolos for the trunks (glued together with frosting) I also used green Sixlets to help decorate. The kids all went home with their jungle hats, pvc pipe dart guns, jungle bags filled with treats, and a balloon snake from the vine game. It was a fun party! If you enjoyed this post, you can follow me on Facebook, Pinterest, Twitter, and Instagram.